Support for the death penalty seemed to peak at a time when violent crime was a major issue in America. The Los Angeles riots took place in April 1993. Rudy Giuliani campaigned for the mayoralty of New York on a staunch law-and-order platform and was elected in 1994, the same year support for the death penalty peaked, with 80 percent of the population approving of capital punishment. The early 90s were a scary time in America, and it’s no surprise average Americans were sympathetic to a more draconian approach to criminal justice. It wasn’t even that crime was statistically high (which it was), but the violent crimes that penetrated the national conversation were especially jarring. A person did not have to believe Rodney King deserved his beating to be frightened by the violent lawlessness in South Los Angeles. 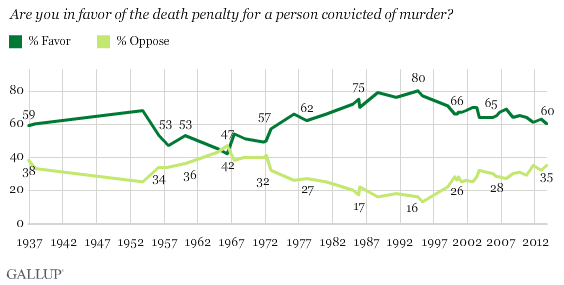 Support for the death penalty started to rise in the 1960s and stayed high (as crime did) throughout the 1970s, 80s and early 90s. Interestingly, although homicides dropped off precipitously in the mid-90s and have continued to fall, support for the death penalty has decreased at a far more modest rate. This likely reflects a completely understandable misperception about the true danger of America. Although the country is in a much better place with regard to violent crime now than it has been in decades, the type of people who are responding to Gallup polls (grown adults) are accustomed to the more dangerous America they grew up in. It seems logical that public opinion would eventually close the gap, and drop its support the death penalty to a degree more commensurate with the plummeting murder rate, but fear culture is big business in America and plenty of powerful people have an economic incentive to make people believe America is still as scary as it was in 1993.